As you may or may not know, this blog is a member of the United Cardinals Bloggers network. Last weekend was the second annual United Cardinals Bloggers weekend. On Saturday evening, some of the blog writers got together for a dinner at Patrick’s in Maryland Heights. Rob Rains provided goody bags for the attendees. This dinner was sponsored by Any Sports City. I unfortunately could not attend the festivities, but I hope to go next year. Rumors are that a good time was had by all. 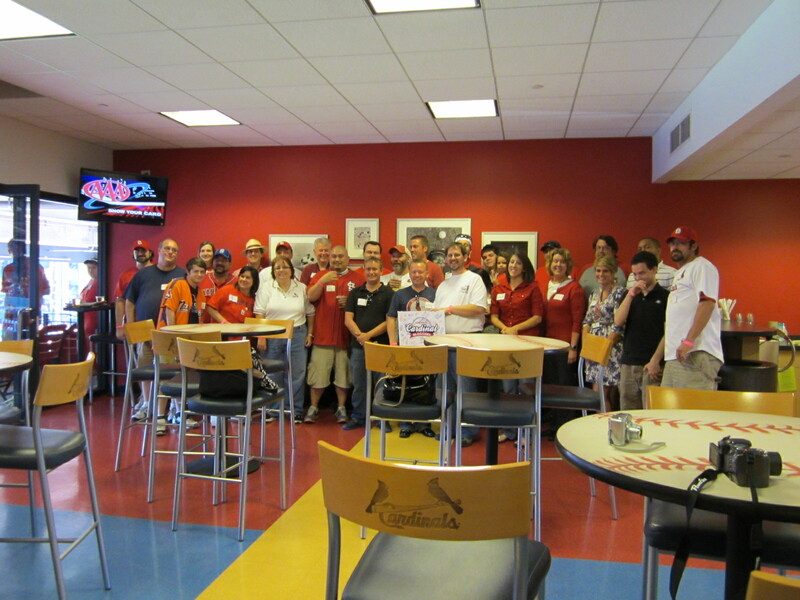 On Sunday, the Cardinals threw a great party for the United Cardinals Bloggers members at Busch Stadium. We entered the stadium through the administrative offices. Lindsey Weber of the Cardinals met us at the front desk and gave us forms to fill out our personal information. We then proceeded upstairs to the conference room. The bloggers visited with each other until 12 noon. Ron Waterman of the Cardinals then called us to sit down. We sat and listened as John Mozeliak and Bill DeWitt gave us reports. Mr. Mozeliak stated that the Cardinals have a bright future coming and there is lot of depth at the minor league level. He also mentioned (and so did Mr. Waterman) that the Cardinals were selected as the Organization of the Year not just because of winning the World Series but also because of the minor league prospects. He also stated that the Cards can’t rely on just the minor league; the free agent market also has to be considered when planning for the future. Mr. DeWitt then took the floor. He stated that the Cardinals front office is trying to do a better job as a information team. They want to be an outreach organization at the social media level of things happening in the front office that are of interest. More information will be coming from the organization. He then talked about Ballpark Village. They are several weeks away from approval at the state level. Once they get the approval, designs can be started. He was optimistic that they may be able to get started on the design process in late October or early November. He anticipated opening in the spring of 2014. There will still be some parking. The plan is 100,000 square feet of retail entertainment with a large plaza for entertainment and the Hall of Fame museum. There will be ticketed rooftop seating to watch games. Mr. DeWitt stated that attendance has been good this year. They try to stay in the top 10 of revenue of major league clubs. St. Louis is a small market team and they are in the bottom third of media revenue. The Cardinals can act like a top third media club because of the great attendance. Mr. Waterman then opened up the floor to questions for Mr. DeWitt and Mr. Mozeliak. 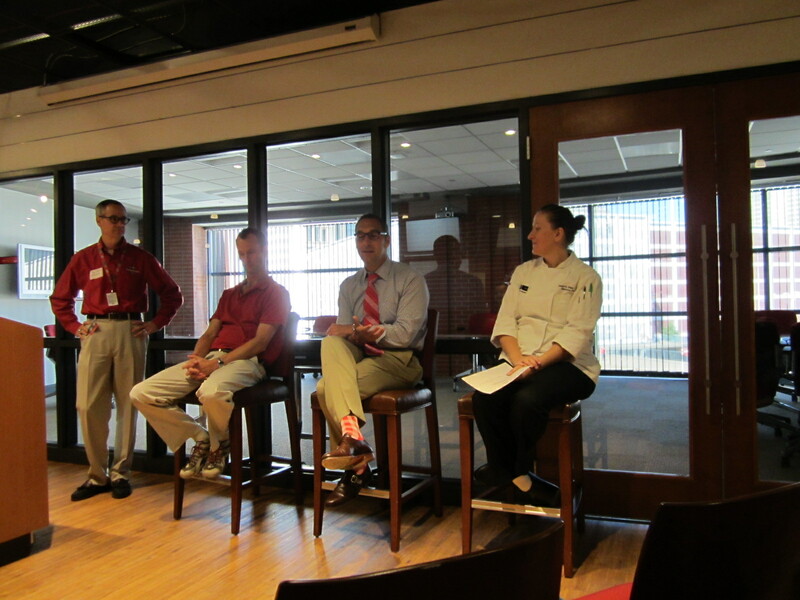 After the Q&A session was over, the floor was turned over to the chef, who explained the different kinds of food available at Busch Stadium and then gave us the menu for lunch that day. The guys’ eyes glazed over after she mentioned bacon wrapped hot dogs. They didn’t hear anything else after that. LOL! We then went to our seats in party rooms 304 (the Jack Buck room) and 306 (the Lou Brock room). Room 304 had the bacon wrapped hot dogs (which were yummy with BBQ sauce), nachos, salad, coleslaw and desserts. Room 306 had build your own macaroni and cheese, which unfortunately I did not get to try. We were able to go between both party rooms. We sat at the tables, ate, and caught up with old (and new) friends. From left to right: Lindsey Weber, yours truly, Christine Coleman (of Aaron Miles’ Fastball) and Mary Schless (photo courtesy of Daniel Shoptaw). We all gave Lindsey suggestions for next year’s get together. Hopefully, she’ll remember them! The game was good too until the top of the 9th when Jason Motte gave up a home run. The Cards ended up winning the game and avoided the sweep, thankfully. Here’s a photo of all the bloggers that were there – can you find me? Thanks to Daniel Shoptaw who set up the whole weekend and the Cardinals, who put on a classy party for all of us. 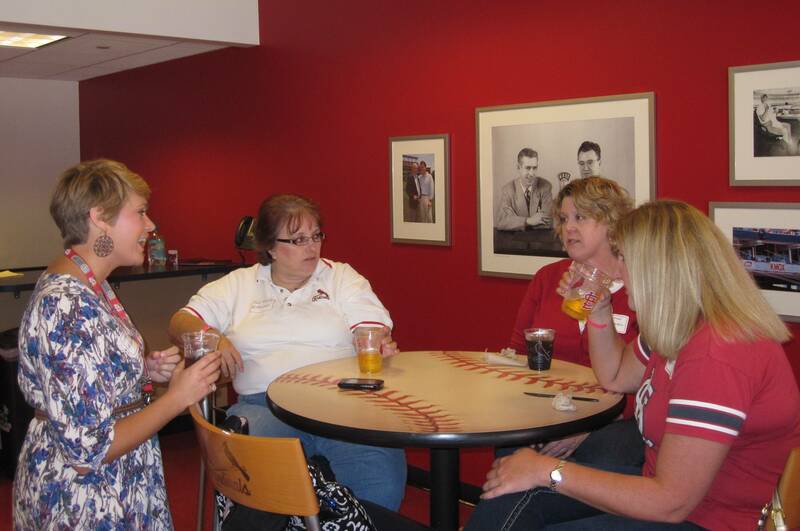 I had a great time and can’t wait until next year’s United Cardinals Bloggers weekend! That’s all for now! See you next time!